As a female runner, constantly feeling stressed by the dogs that owners let loose around the countryside. Although I know in theory how to deal with aggressive dogs, I decided that I also needed some form of protection other than just a stick. 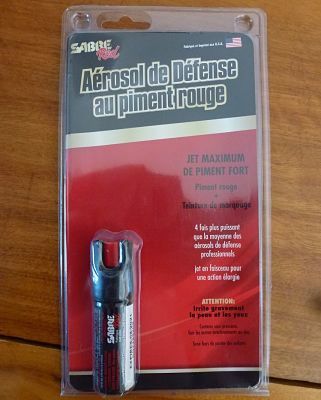 I spent a LONG time researching which was the best brand of pepper spray to buy before opting for Sabre Red Pepper Gel. 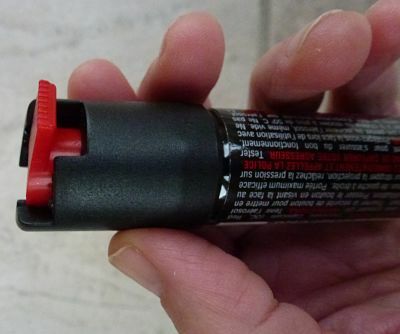 I also discovered that not all countries allow pepper spray (the UK doesn't but the US does and France does too but has strict rules). I ended up choosing Sabre Red pepper gel as it seemed to have the best reviews, was available in France and just seemed a more reliable brand than some of the others. 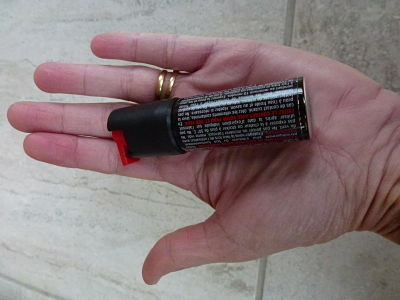 Generally pepper spray comes in 4 different forms - gel, foam, stream and fog. I went for the gel because it squirts further than some of the others but the main reason being that because it is thick and sticky, there was less risk of it blowing back in my face on a windy day. I live in a very windy part of France. I was only able to find the small canister (16.5ml) and I did worry that it wasn't going to go far. However I was quite glad in the end as the size of the canister is perfect for fitting in a jacket pocket or discretely in my hand. If you shake it you can hear the gel sloshing inside which was reassuring however there is no way of knowing how much is left inside. The Sabre website says that a 16ml (0.54oz) canister should fire about 25 quick bursts. But what is a quick burst? When I'm faced with danger, I might fire it all at once!! There is no lid or cap to remove in order to open it. You simply flick the red cap to the right and it exposes the jet hole. I must admit, simple as that is, I worry that it is too simple and that I might open it by accident. I was pretty scared of this tiny canister when I first got it so I thought it best to test it out. I attached a piece of white paper to our shed outside, stood a couple of meters from it and then aimed my spray. Apparently I should be able to hit my target from 3 - 4 meters away. I was surprised how one tiny press of the red button produced such a decent and satisfying jet. Aiming well is definitely not my strong point judging by the red trail I left over the shed. I did also experience a very, very mild tingling in my eyes so I guess there was a tiny bit of blow back. The gel is not red but is more orange which was not what I expected and it contains a UV dye which is helpful in suspect identification. I don't think the dogs are going to be doing a line up suspect parade! Having tested it, I started to feel a wee bit more confident about running routes that I had previously avoided. Sabre Red Pepper Gel Review - Real Test! A month after receving my pepper gel, I had to use it for real! 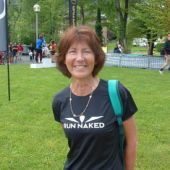 I had stopped running one of my favorite routes through a village as a really unfriendly dog had taken to roaming around the village and chasing runners, walkers and cyclists. You couldn't even run along the road near its house as it would come and get you, baring its teeth and snarling. I tried talking to the police who said I needed to talk to the owner first. I tried that but he/she was never in but I did speak to a farm worker who said he'd pass on my anxieties. That never seemed to happen. Anyway, one particular morning when it was windy and cold, I decided to be brave and I ran through the village and past the dog's house, pepper spray at the ready. However it was not there so I put the spray away and I ran on. I was about 300meters from its house when I heard a growl and there it was coming up behind me. I was all fingers and thumbs trying to get the spray out from my backpack pocket but I managed a couple of squirts at the dog. Being windy and being stressed, I missed its face but it stopped to sniff what I had squirted on the ground. I started moving backwards and it came for me again so this time I just held my hand up as though I was going to spray it. That was enough to stop the dog and it turned on its heels and left. I sprayed 2 bursts and the canister seems now about half full although difficult to say exactly. I'm pretty sure it is not going to last 25 quick blasts. That incident, although scary, has given me a huge confidence boost in knowing that I can protect myself. The pepper gel spray worked a treat (even though I missed!) and although it was windy I didn't suffer any blow back. 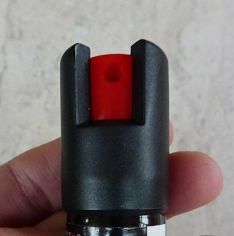 I am now a pepper spray convert. I am planning also to get one for my daughter to carry when she is out late at night. Naturally I am not going to use pepper spray every time I see a dog when I am out running. However it is reassuring to know that if necessary, I have a line of defense. I haven't tried any other brands so I am not able to make a comparison, however I am definitely very happy with the Sabre Red Pepper Gel and will be using that for the time being. I bought 3 canisters so I think that will last me a while! 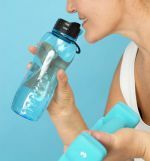 If you don't want to carry and self defense with you when running, here's how to deal with dogs whilst running.